Kerala is home to some of the best wildlife sanctuaries and national parks. Kerala is rich in its wildlife resources. 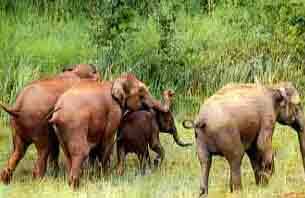 The wildlife resources in Kerala has played a major role in shaping the tourism bussiness of the State. The State has also taken necessary step for the preservation of the precious wildlife animals.Kerala can also boast of some of the best Willife sanctuaries and national parks in the world. The climate of Kerala is best suited for some of the best and rarest wildlife species. The wildlife animals include elephants, tiger, cranes, Spotted Deer, Panther, Squirrel, Snakes and more. Some of the well known Wildlife sanctuaries and National parks in Kerala are Wayanad Wildlife Sanctuary, Periyar Wildlife Sanctuary, Thattekad Bird Sanctuary, Parambikulam Wildlife Sanctuary, Idukki Wildlife Sanctuary, Chinnar Wildlife Sanctuary and Neyyar Wildlife Sanctuary. The type of forest also include Rolling Grasslands, Thorny Scrub Forest With Xerophytic Species. Dry Deciduous Forests, Wetlands and Tropical Dense Evergreen Forest.